Boskke improves conventional gardening tools and products for contemporary urban lifestyles, an evolution of gardening design. This innovative company encourages abundant greenery in homes and workplaces everywhere. Boskke products celebrate and support plants because living in an environment with plants that not only look beautiful but also increase oxygen and filters air, bringing greater vitality to the built environment. In just over a decade, more than half of the population will live in densely populated urban environments. Boskke is taking lead to naturally improve city life with evolved gardening gear that’s easy to use and stylish to look at. 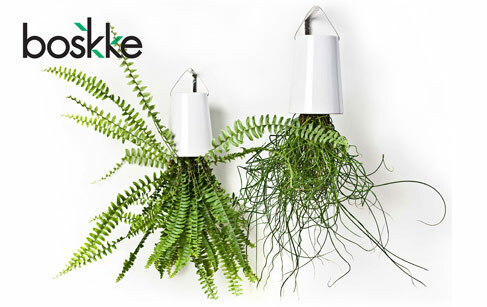 Living with plants becomes effortless with Boskke’s urban gardening range that works indoors and out, in spaces large and small. Boskke is derived from the old English word ‘bosky’ which means ‘a small forest’ and that’s exactly what you can create with their intelligent eco-sensitive designs.